Energy efficiency plays a large role in LifeBridge’s sustainability efforts. In 2010 Sinai Hospital began to replace its fluorescent light bulbs with energy-efficient LED light bulbs. The purpose of doing this was not only to reduce its energy consumption, but also to prevent people from being exposed to the toxic element of mercury, which is found in traditional fluorescent lights. LifeBridge replaced F32T8 lamps with 15-watt lamps and drives in non-patient care areas of the campus. These replacements will reduce the current 259.25 KWH load by more than half (144.38 KWH). Most of the lamps burn 24/7 with a small percentage in intermittent use. The estimated life of light bulbs is 80,000 hours. LifeBridge expects to have to change the LED bulbs once every 5 –7 years. A variable-frequency drive (VFD) is a system for controlling the rotational speed of an alternating current (AC) electric motor by controlling the frequency of the electrical power supplied to the motor. A variable frequency drive is a specific type of adjustable-speed drive. Variable-frequency drives are also known as adjustable-frequency drives (AFD), variable-speed drives (VSD), AC drives, microdrivesor inverter drives. 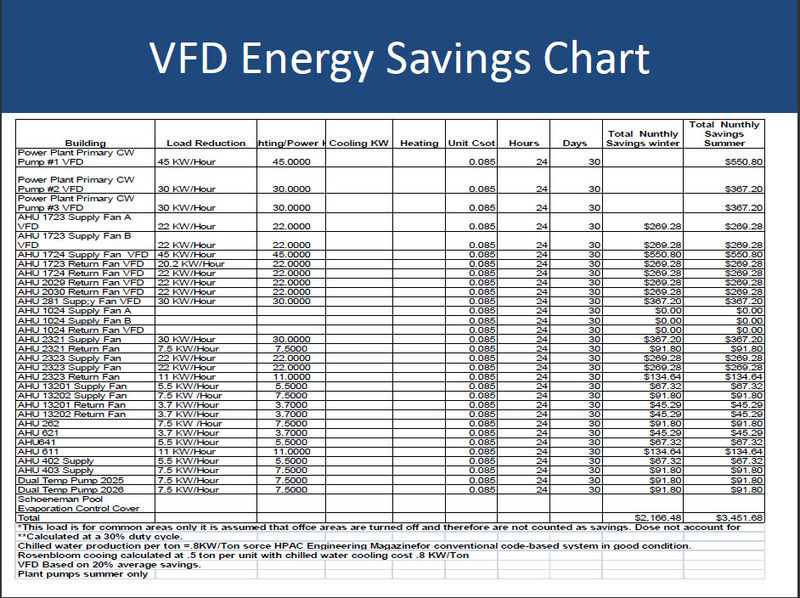 To date 43 VFDs have been installed under BGE’s Energy Conservation program. They are located on pumps in the power plant and air handlers throughout the campus. With these energy efficient motor drives in place LifeBridge has reduce energy intake by 20%, as less mechanical energy is wasted. The monthly savings for the combined energy budgets for Sinai Hospital and Levindale Hebrew Geriatric Center and Hospital is an average of $7288.00, or $87456.00 annually. Lower maintenance costs because lower operating speeds result in longer life for bearings and motors. Controlled ramp-up speed in a liquid system can eliminate water hammer problems. The ability of a VFD to limit torque to a user-selected level can protect driven equipment that cannot tolerate excessive torque. Since this change was implemented Sinai Hospital has saved $850,000 in overall lighting costs, and it will save an additional $140,000 in 2012. Sinai will also be adding on the Children’s Hospital with an additional 31,048 sq footage with no increase to the 2012 utility budget. Below are a few examples of how energy has been measured at Sinai Hospital. The Energy use of the Sinai Hospital building has been measured and compared to other similar buildings using the Environmental Protection Agency's (EPA's) Energy Performance Scale of 1-100, with 1 being the least energy efficient and100 the most energy efficient. Help is out there for organizations to implement sustainable energy programs. The savings are real. You WILL see a reduction in your operating budget. “Low hanging fruit” projects could be operational in as little as six months. Lewis Poe did it, and he’s willing to help you!